The bad news is there’s limited cell phone service in Pocahontas County, West Virginia. The good news is there is limited cell phone service, so you can disconnect for a while, be more attentive to your travel partner(s), and engage at a deeper level with the local people you meet along the way. Sitting outside the country store in Slatyfork and listening to Tom Shipley tell how his family had been in the area since the 1700s was just one of the incredible stories I heard during my visit; and just one of the many times not reaching for the cell phone every time we stopped paid huge dividends during my stay in Pocahontas County. When I was asked by the local tourist board to explore the area for a couple of days of riding, I put a call into my good buddy, Drew Alexander, for some company. He works in a multi-line motorcycle dealership, and when he found out I’d be riding a BMW R1200GS, he suggested he ride a Harley cruiser so we might represent different tribes on our ride. After all, he’s from Brooklyn, and I’m from England, so we are already like chalk and cheese. It seemed like the perfect plan, so we set a date to meet in the small town of Hillsboro at the Pretty Penny Café. Drew riding on the Highland Scenic Highway. For me, this meant a five-hour ride north from my home in Charlotte, NC, and by the time I was in West Virginia, I was breathing deeply and taking in the beautiful mountain landscape rolling past the big GS. The roads are immaculate, and the traffic was light as I made it to US 219 to work my way into Pocahontas County. Within five miles of making the turn, my expectations had been exceeded and then some, as I carved my way through the peaceful West Virginia countryside. Feeling reminiscent of Southern England, the architecture and riding on the right-hand side of the road being the only major differences, it’s one of those roads that you just want to turn around and ride again. It’s that good. 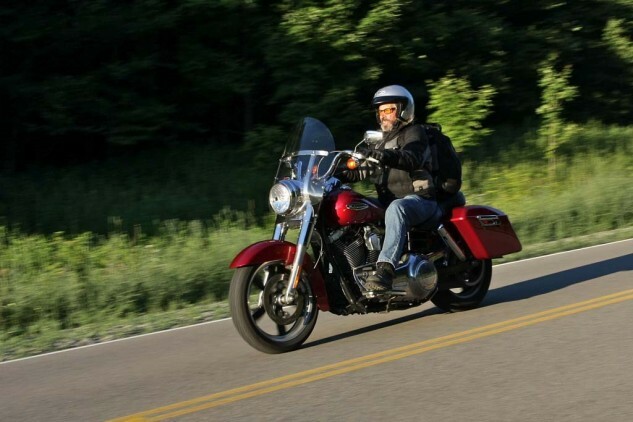 With hardly a single car seen for miles and the most stunning country views at the crest of every hill or around every fun-filled bend, I began to wonder if the person who tagged West Virginia, “Almost Heaven,” had been a motorcyclist. On arrival in Hillsboro, I settled on the outdoor porch at the Pretty Penny Café and allowed the relaxed atmosphere and afternoon sunshine to wash over me as I waited for Drew and our hosts. A simple town working the sides of the highway, it was no surprise the biggest, and best-maintained building was the church. While I’m used to a lot of churches in my travels in North Carolina with a wide variety of messages on marquees, it was interesting that the message I noticed posted outside most of the churches in WV was simply “everyone welcome,” regardless of denomination. An early dinner gave us the chance to learn about the highlights of the area from our tourist-board friends, but with the sun sinking in the early evening, we saddled up for a quick visit to the birthplace of Pearl S. Buck, the American novelist, that now serves as a museum before we lost the light. A white, wooden, two-story home, it has an elegant simplicity from a time gone by. The Pearl S. Buck Museum grounds include the homes, sheds and cabins of several relatives, some of them relocated from neighboring counties. Still, we didn’t visit for long, as the Highland Scenic Highway awaited. A short detour off our intended route, we wanted to be there before the sun left us completely to enjoy the views we’d been promised. Gaining a maximum elevation of around 4,500 feet, the views were stunning. We were alone again, and the cool air was a refreshing treat after the summer temperatures I’d left behind in Charlotte. I shouldn’t say we were completely alone, as we did see a very timid looking black bear that wandered out onto the road ahead, saw us coming and hit maximum velocity before disappearing into the woods. 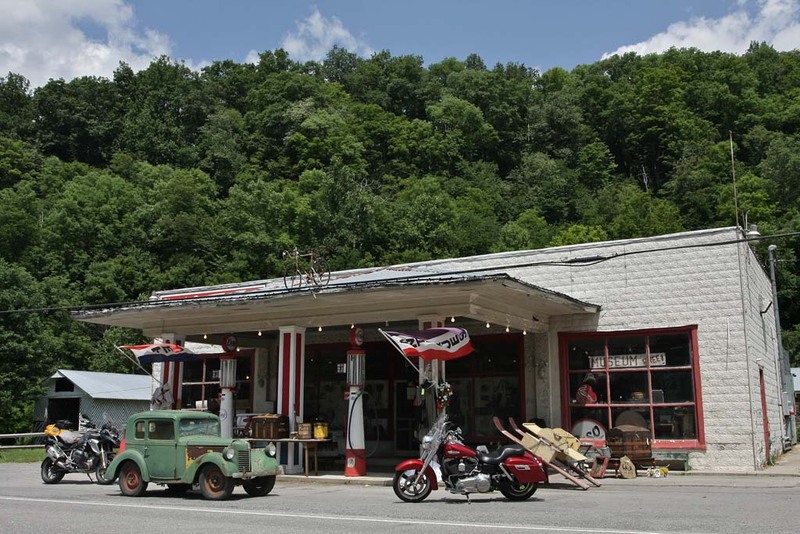 With the sun burning the vast hardwood forest a deep gold and the hazy mountain views competing with our attention for the road, we reconnected with US 219 and headed north to Slatyfork to the Morning Glory Inn for the night. This type of accommodation makes traveling in these areas even more rewarding. Owned and operated by Rod Molidor and Karin Anderson, it’s like staying with relatives in their posh country home. The last light of day was showing their extensive landscaping and flower gardens while we were shown to comfortable rooms and left to relax. While fully appreciating not being bothered by my cell phone during the day, it was nice to have access to high-speed internet in the evenings so we could make sure nothing back in the real world needed our attention. We rounded out the day in the communal living area on plush couches relaxing and working on a plan for the next day. Waking to a valley full of low-lying clouds meant more time over our continental breakfast, drinking good coffee and chatting with our fellow guests. Conversations among our eclectic group were fascinating, and, with the perfect excuse that I couldn’t take pictures till the sun came out, it was a wonderful, lazy start to the day. When the sun finally broke through, we saddled up and started meandering back south on US 219 toward Marlinton. While we were visiting the Pearl Buck house, we had met a lady named Brynn Kusic who runs the Pocahontas Opera House in Marlinton. She had told us we must visit, so it made a great excuse to spend more time on this wonderful road. We didn’t get too far before we stopped at the country store on the old Sharp farm, and were soon in deep conversation with Tom Shipley, who can trace his lineage back to the 1700s on this exact spot. He regaled us with tales from the Civil War, visits by Robert E. Lee, and a 10-year fight to stop the family farm being turned into a sewage plant. Meeting a heroic David, who, with the assistance of many local people, beat the proverbial Goliath to maintain his family’s history, was extremely inspiring. Tom Shipley’s country store, established in 1926. Realizing it was close to noon and we had actually made a total of seven miles in the wrong direction from our original plan, we rolled on back further south to Marlinton, founded in 1749, for lunch. A lively town set over a wide, lazy stretch of the Greenbrier River, we sat out on the veranda at the Greenbrier Grille and chatted with local families on vacation in the area. 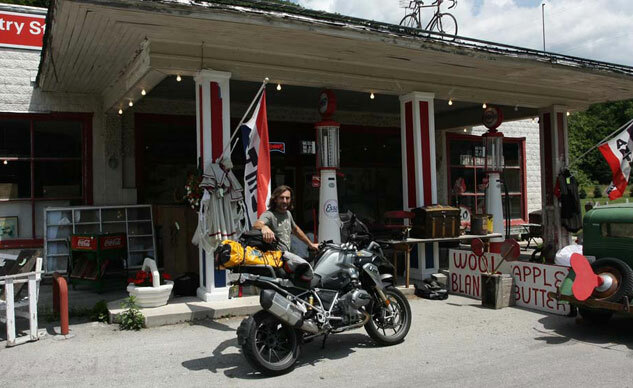 There was a fair amount of motorcycle traffic, and leaving the restaurant, we bumped into Florian Neuhauser and his brother, Manuel, and learned of the annual Road Runner Magazine rally at Snowshoe. Not surprised to find one of the country’s premier motorcycle travel and touring magazines using this area for their event, we arranged to meet up with them later and then rolled on to see one of the highlights of our tour: The National Radio Astronomy Observatory and Science Center. With the destinations requiring a ride south on US 39 and north on US 28, both incredible motorcycling roads, the day just kept getting better. We were able to secure a personal tour of the facility with Jessica Thompson and learned much about the Green Bank Telescope, which is the world’s largest movable radio telescope. Visitors are allowed to tour within a couple hundred feet of it, but only vehicles with diesel engines are allowed near it and the other telescopes to minimize interference, so between this and the old buildings, it feels somewhat like being in a ’60s Sci-fi movie. We learned that it’s the reason there is no cell phone service, or Wi-Fi, in this area, as there is a 13,000 square mile area around Green Bank known as The National Radio Quiet Zone. 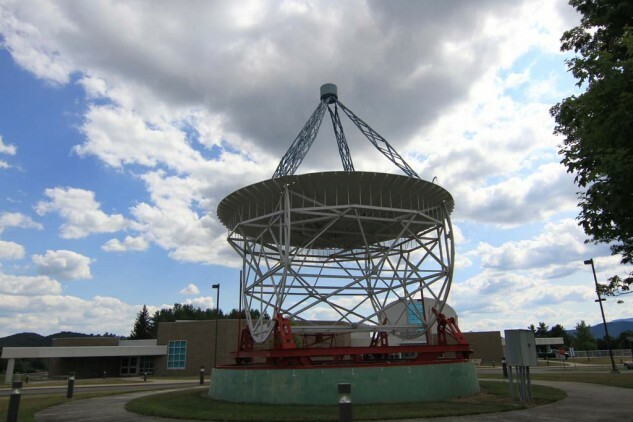 Listening to sounds from outer space for years on end doesn’t sound like too much fun to me, but we learned a lot of discoveries have been made that have changed our modern world in significant ways since the facility opened. Green Bank Telescope is certainly worth the time to visit if you are in these parts, and just a short distance south and west found us in the Cass Scenic Railroad State Park. Here you can sign up for a tour on a steam train through the local area. The town of Cass itself has been restored, so you have the feel of an early 1900s town as you wait for the train, and it’s one of the area’s premier attractions. We were a little late in the day for a train ride, but wandering around the old town and looking at the steam engines was still a treat. The sight and sound of these magnificent beasts always brings good memories. Our destination for the night required us to head east, but the Road Runner event was a little further west in Snowshoe, giving us a chance to add a few more miles to our riding day. The road twists and turns up the mountain and is as enjoyable as any piece of American asphalt I’ve ridden for pure motorcycle riding enjoyment; that is if you like corner after corner. We found the Road Runner team preparing for a banquet to serve 300 adventure-travel riders who had arrived on every brand and type of motorcycle you could imagine. We spent some time visiting before heading on for the last ride of the day. Our ride to Frost was charming. The sun was slowly dropping, lighting the countryside with extra color. A large wooden sign on the road had advertised “collecting hats,” and I couldn’t refuse a visit. 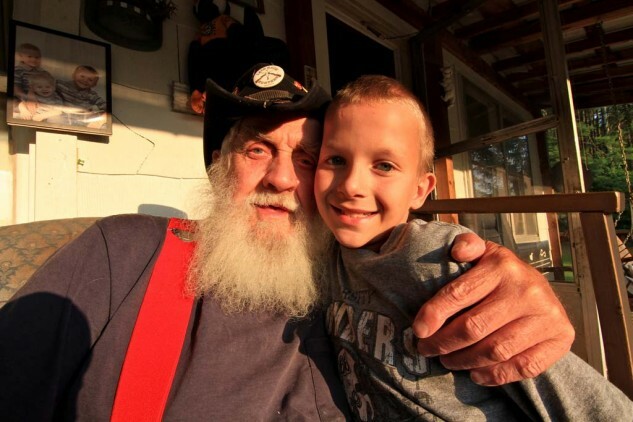 We met an old, local gentleman who collects baseball caps, and his great grandson. Young Boynton proudly showed off the collection that currently numbers close to 8,000. Boynton and his Great Grandfather after showing us the hat collection. We were just five miles from our destination for the night, the Inn at Mountain Quest, and little did we know it would be one of the most interesting evenings I’ve spent in over 35 years of world travel. On arrival we were greeted by 80-year-old Dr. David Bennet and his wife, Alex, and treated to a wonderful meal. 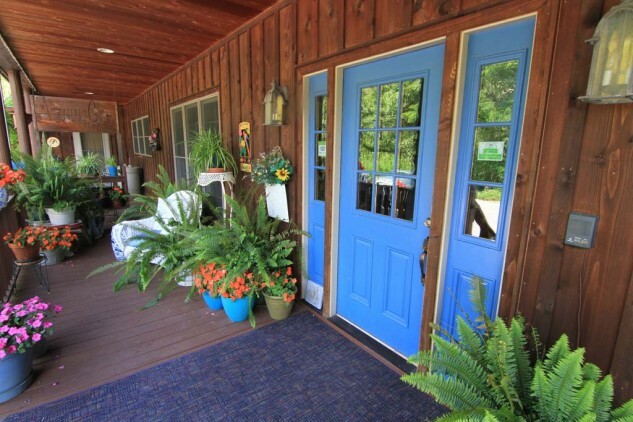 The Inn was originally built in 1892, and David and Alex have added 12 incredible themed rooms, and you have to see them to believe this sort of accommodation exists deep in the Alleghany Mountains of West Virginia. With 150 acres of the 450-acre estate given to llamas, horses, and cows, David told us keeping livestock was a deliberate move for he and Alex to stay active. As the birthplace of Intelligent Complex Adaptive System (ICAS), a new theory emphasizing the importance of the individual relationships, and knowledge to surviving and growing in the new world, a visit to the Mountain Quest Inn is a fascinating experience. 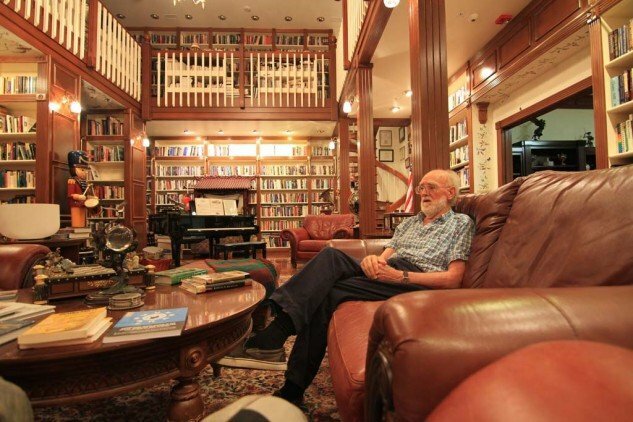 Dr. David Bennet in his research and reading library. Open to the guests. A hearty home-cooked breakfast, and another pleasant morning spent in conversation with fellow guests, was the prelude to some time feeding the animals with David and Alex the next day. First, we visited with the llamas, then the horses, as they regaled us with incredible stories from their lives and their work at Mountain Quest. Published authors, innkeepers, animal caregivers, and more, they are terrific hosts. 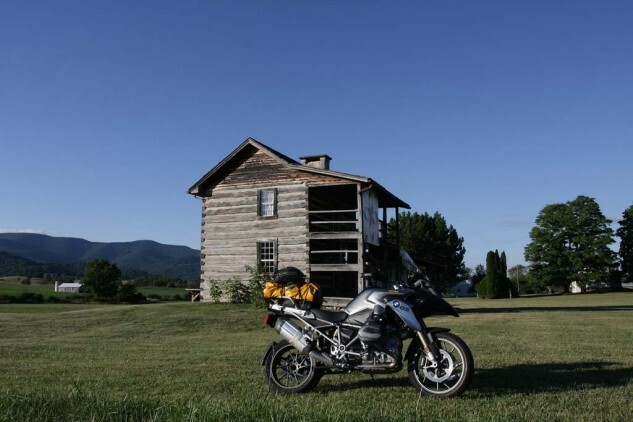 Any visit to Pocahontas County requires at least one night here, as you will leave extremely well fed, rested, and deep in thought as you ride away. With the short tour winding up, we literally had to drag ourselves away from our hosts. We elected to run out of the county on US 92 to pick it up before working our way home. This was like saving the best for last, as we meandered along, smooth, curvy country roads, with little to no traffic and only intoxicating views for company. Old barns, lazy farms, and hazy mountain views greeted us at every turn, and it was another of those rides you just don’t want to end. 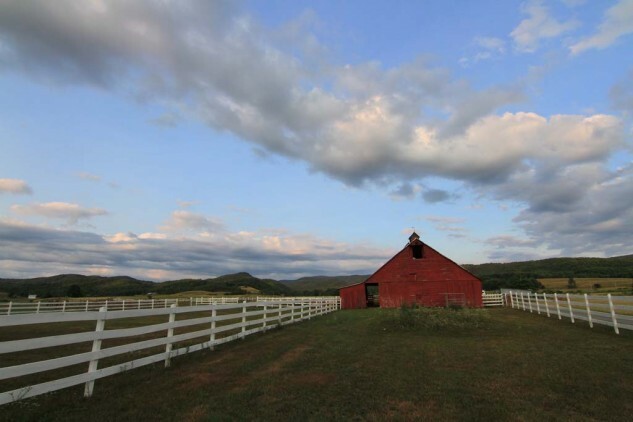 Typical West Virginia barn and sky. Unfortunately, real life was calling, so we said our goodbyes and rode in opposite directions for home. It had been a wonderful introduction to a part of the world I will definitely return to, especially as we didn’t get a chance to do a tenth of the activities available here, from mountain biking, white water rafting, hiking, fly fishing, golfing and more. We made no heroic distances on the odometer while in the county, but the places we had traveled, internally and externally, were meaningful and rewarding in equal measures. Being digitally disconnected meant more real life connection, and every one of the many attractions is reached on some of the best motorcycling roads I’ve experienced. No further endorsement needed.